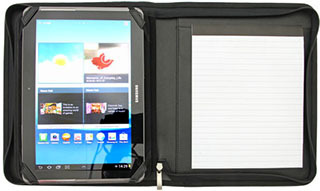 Soft Koeskin PU with double sided inside divider and removable tablet/ipad holder 250 x 190mm. Multiple inside pockets, smart phone pocket, elastic USB holders & pen loops, lined pad. Full zipped closure.